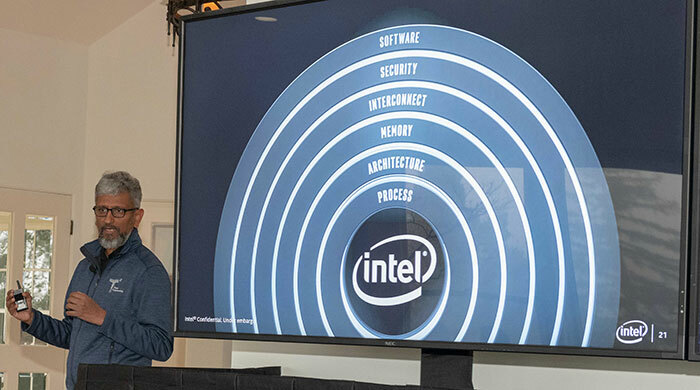 The scheduled Intel Architecture Day presentation has come to an end and Intel has now provided a brief summary of events via its own news blog. The day included important presentations from new Intel big-guns such as Raja Koduri and Jim Keller, revealing significant changes to Intel design and engineering strategy, a demonstration of the claimed industry first 3D-stacking of logic chips, details of the new Sunny Cove CPU architecture, the unveiling of Intel Gen11 integrated graphics, and more. Intel will change its design and engineering approach to be anchored upon six strategic pillars. 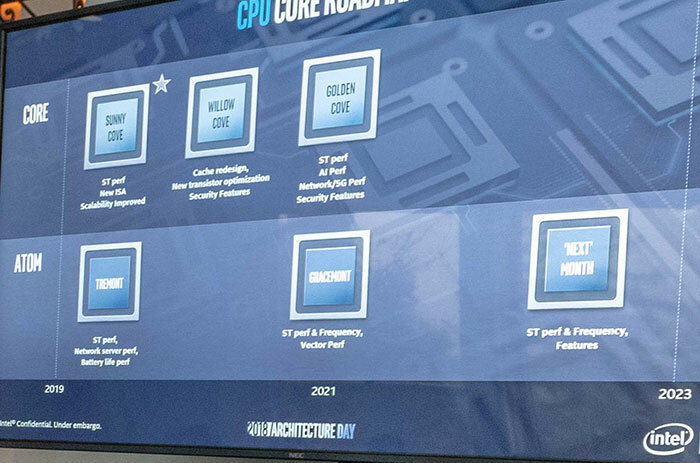 As you can see in the slide above, presented by Intel's senior vice president of Core and Visual Computing, Raja Koduri, the pillars are process, architecture, memory, interconnect, security, and software. Further explanations of each step can be found on the Intel blog and the same post includes a Q&A with Mr Koduri. In the Q&A the Intel SVP explained that the six pillars will help Intel achieve a bold engineering vision over the next five years "to deliver 10 petaflops of compute and 10 petabytes of data within 10 milliseconds to every person in the world". Furthermore, Koduri explains that the six pillars is a multi-dimensional effort to prove that "Moore's Law is about more than transistors alone". A new 3D packaging tech dubbed 'Foveros' was demonstrated by Intel. Foveros is said to combine high-performance, high-density and low-power silicon process technologies and will afford "tremendous flexibility as designers seek to mix and match technology IP blocks with various memory and I/O elements in new device form factors," according to Intel. We will see the first Foveros products as soon as H2 2019 and it will feature a 10nm stacked compute chiplet with a low-power 22FFL base die.Intel says Foveros is a leap forward compared to what it achieved with 2D EMIB products which debuted earlier this year. The first Sunny Cover CPUs will be released in H2 2019 and will boast "reduced latency and high throughput, as well as offers much greater parallelism". Intel thinks gaming, multimedia, and data-centric applications will all benefit from Sunny Cove. A photo shared on Twitter yesterday eve showed that Intel's Sunny Cove provides up to 75 per cent better performance in 7-Zip (the app's built in benchmark I guess). I see PCWorld has an update on that test and reports that a specially compiled version of 7-Zip was used to take advantage of Sunny Cove hardware. Coming to 10nm Intel processors next year is the latest Gen11 iGPU with 64 enhanced execution units, more than double previous Intel Gen9 graphics (24 EUs). Intel asserts that these GPUs will break the 1 TFLOPS barrier (and thus a similar TFLOPS perfromance to the AMD Radeon Vega 8). At the event yesterday evening, Intel didn't give Gen11 graphics gaming comparisons, rather it showed that the integrated processing nearly doubled the performance of a popular photo recognition application compared to its currently available iGPUs. Intel added that the Gen11 graphics is expected to feature an advanced media encoder and decoder, supporting 4K video streams and 8K content creation in constrained power envelopes. Support for Adaptive Sync will be there for smoother gaming too. 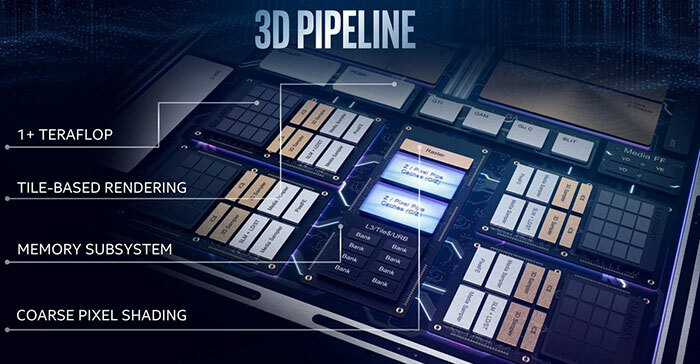 Intel restated that it is pushing ahead with plans for a discrete graphics processor for launch by 2020. The rest of the news appears to cover pillars such as memory/storage and software. On the former, Intel discusses advances in Optane tech and demonstrated SSDs based on its own 1 Terabit QLC NAND. On the latter pillar Intel announced the 'One API' project to simplify the programming of diverse computing engines across CPU, GPU, FPGA, AI and other accelerators. A deep learning reference stack, optimised for Intel Xeon Scalable platforms is also on the way. A new 3D packaging tech dubbed ‘Foveros’ was demonstrated by Intel. Foveros is said to combine high-performance, high-density and low-power silicon process technologies and will afford “tremendous flexibility as designers seek to mix and match technology IP blocks with various memory and I/O elements in new device form factors,” according to Intel. So they're moving to Chiplets like AMD. They've even not tried calling their 22nm I/O die an I/O die like AMD has. It sounds like Intel had a shelved chiplet design, saw what AMD has done and has unshelved it because if AMD hadn't done this with the Zen 2 lineup, they might have continued with the standard monolithic approach. The first Sunny Cover CPUs will be released in H2 2019 and will boast “reduced latency and high throughput, as well as offers much greater parallelism”. Intel thinks gaming, multimedia, and data-centric applications will all benefit from Sunny Cove. So Intel have been forced to move away from their single core focus and have had their hand forced in making a new architecture. That's pretty impressive for integrated graphics. Would really like to see an AMD 3xxx APU versus a gen11 Intel integrated solution with price/performance metrics (which is what is the primary consideration for these types of systems). If it is low power and can perform that well, Intels integrated graphics will still stay relevant. Not much about the dedicated side as expected, i'm sure there'll be more info in 2019 as it draws closer. However, average development expectancy for a GPU architecture by Nvidia and AMD has been over 3 years. To go from absorbing GPU development talent then releasing a GPU in 3 years from a company that only deals with low power integrated solutions does concern me. I hope Intel isn't just thinking they can throw excessive money and manpower at a problem and it will suddenly create a working product. I look forward to further updates! “10 petabytes of data within 10 milliseconds to every person” what this really means? data transfer speed inside the CPU?, even top level switches will struggle if this means over any type of network layer. That's pretty impressive for integrated graphics. The weird part to me is presenting this as some step forward when they've shipped mobile APUs quicker than 1TFLOP already; the i7-6970HQ (72 EUs) is at ~1.2TFLOPS and there's Xeons clocked a little higher. I guess they've decided desktop users get the option now? Is that double or single precision or is it 4 bit. Raja Koduri is once again overpromising.